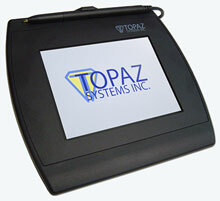 Topaz SignatureGem signature capture pads offer a variety of sizes both with and without LCD options. See below for individual details. Topaz signature pads are bundled with SigPlus software tools, applications, plug-ins, examples, demos, and support at no extra charge. The Topaz T-LBK57GC-BBSB-R is also known as Topaz Systems	T-LBK57GC-BBSB-R	or TLBK57GCBBSBR	.